Here's an after the fact experiment with some successes and some not. 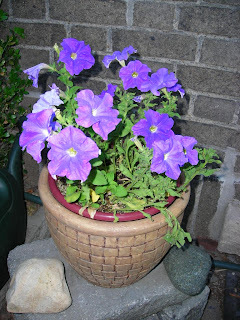 I got an idea for making self-watering pots and then did some research on the net. I found some very expensive pots that I could buy and some very intricate plans for making your own. 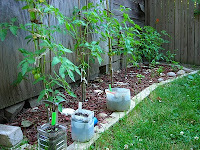 Fortunately I came across a site for a simple and inexpensive way to make self-watering pots. 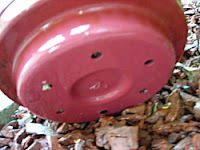 I think it was on HGTV that they showed how to take two clay pots and "soder" them together with epoxy and paint them and what not to make your own more decorative s-w planter, but I didn't have any of those items on hand. So I searched my stash and found a plastic planter with a saucer attached that would fit inside the pot I have for the back door. 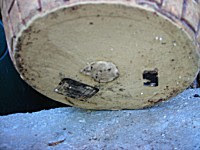 I pulled off the bottom saucer which revealed the 5 holes in the bottom of the pot. The decorative pot had a whole in it so I took a healthy size gob of plumbers puddy and rolled it into a ball then rolled it into a tube. I stuffed the tube of puddy into t he hole in the pot so that about an inch and a half was sticking out of the bottom then flattened the puddy down on both the bottom of the pot and the inside bottom which created a plug. Then I added some pea stone mostly because the plastic pot fit a little too tightly inside the decorative pot so the pea stone brought it up a bit so that I could get my fingers under the rim of the inner pot to add water occassionaly. The soil I used is a mix of 1.5 parts top soil, 1 part peat moss and 1 part perlite or there abouts. I must say, this experiment is working out very well since the plant has been in there for about 2 weeks now and I haven't killed it. Here's a pic of part of my garden with the experimental herbs growing. The verdict is still out on the recycleable s-w planters since the herbs haven't really done much other than germinate as of yet. They also seem to be dying off before they get any bigger... Too much water? I dunno.